Nothing pairs better with good food, than a good wine. A well selected wine enhances your dining experience and gives your taste buds a boost. Whether you are attending a corporate event or cooking at home for a weekend party, you need to know what wine goes best with each plate. Let’s go over 5 ways to pair food and wine for a great taste. Champagne is a sparkling wine made from grapes. It’s refreshing; with a hint of sweetness it tastes best with salty foods. To impress your guests, serve Shanghai noodles with nori salt & fresh peas; or Seared Ling Cod Filet with a maple miso sauce and pair it with a glass of premium Champagne. Light to medium bodied red wines like Pinot Noir, are an excellent partner to recipes that include truffles and mushrooms. This type of wine has a light texture and savoury depth that tastes best with dishes that have earthy flavours. Chardonnay is one of the most popular white wines. It has a rich and creamy texture and fruity flavours. The wine tastes delicious when paired with seafood in a rich sauce, such as salmon, sweet shellfish, and white-fleshed fish. These are a contemporary pairing to complement each other perfectly. Cabernet Sauvignon is a famous red wine, popular around the globe. The strong aroma and fruity flavour of this wine enhances the taste of juicy red meat cuisines such as lamb chops or steaks. Each bite of the meat will melt in your guests’ mouth when they sip this tannin-rich wine. Dry rose is both fruity like a red wine and acidic like a white wine. This light-coloured wine tastes best when young and is a great partner for cheese based dishes like Italian cheese sandwiches, macaroni and cheese, etc. The cheese will pair well with the subtle berry and low-tannin flavour of dry rose. These pairings will tantalize your taste buds and refresh your palate after every bite. 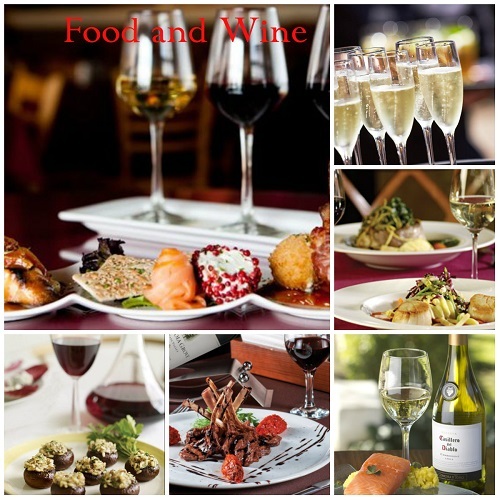 If you are organizing a cocktail party, then ask your caterer to serve their cuisines with the wine that pairs best. If you are hosting a dinner party, then surprise your guests with these food and wine combinations.